I don't know about you, but I'm ready for a vacation. I've been working non-stop full time for over a year, I haven't even taken a sick day, so I'm exhausted. Plus I've just completed a killer work week; my schedule was so difficult. It was one of those 'close the store at 9:30 p.m., go home and go to sleep for 6 or 7 hours if your lucky, then get back up early in the morning and open the store' work weeks. Those are hard! Well, I can't take a vacation just yet, I requested a vacation for the first week of August. My daughter, son, and son-in-law are all coming home for a 2 week visit. We don't plan on going anywhere far. Just hanging out at home, having friends over we haven't seen for awhile, visiting friends, and maybe we'll go to a water park or pool or something. I really don't care. I'll just be so happy to rest, relax, and have my kids home again. So, I tell you all that because when The Hotspot Challenge came up with the theme "Time for a Vacation! ', I could certainly not agree more! I was more than thrilled to do this challenge. The challenge is to use the top three vacation spots in the United States as your inspiration. There are some photos of them on the top of my post. They are: Florida, California, and Las Vegas! Well to make my card, I picked Florida! 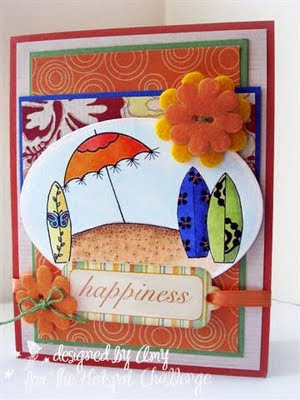 I love the beach, so I used McMahon Five Designs 'The Beach Scene'. My papers are from DCWV 'The Summer Stack', and the sentiment is a DCWV Chipboard Accent. The felt flowers are from JoAnn's Fabrics and Crafts. The main image is colored with Copic Markers and is popped up on dimensionals. This month if you play the challenge, you get a free digi of a really cute palm tree just for linking your card to the Challenge Blog. And, as usual, one lucky randomly chosen winner will receive $25.00 worth of FREE digis from the McMahon Five Designs Store. What a lovely card - so 'warm' and cheerful!! What a fun summertime card. That beach looks warm and inviting!